The Blaser R93 Tactical is a German sniper rifle, based on the Blaser R93 design. It has as variants the Blaser LRS 2 and Tactical 2. It is used by German and Dutch police forces as well as the Australian military and special police units. The rifles were manufactured by the German firearms manufacturer Blaser. 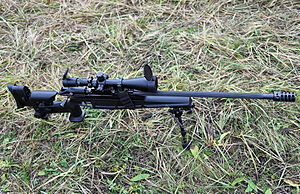 The LRT (Long Range Tactical), LRS 2 (Long Range Sporter 2) and Tactical 2 rifles are straight-pull bolt-action take down sniper rifles. The straight-pull action design was introduced in the Blaser R93 hunting rifle line. These actions allows for faster follow-up shots compared to traditional turn bolt actions. The rifles are designed to fire small groups (sub 0.25 MOA) with factory match ammunition. The LRS 2 version, comes chambered in .223 Remington, 6mm Norma BR, 6.5×55mm, .308 Winchester and .300 Winchester Magnum. An uncommon part of its design is that it is a straight-pull bolt-action rather than a turn-bolt, which allows for much faster follow-up shots. The 14-lug radial collet ensures the centering of the cartridge when fed into the chamber assisting in its accuracy. Barrel changes by an experienced person can take place in under 60 seconds. The Tactical 1 (very low production) or 2 version is available in .223 Remington, .308 Winchester, .300 Winchester Magnum and .338 Lapua Magnum and has a larger action and barrel to accommodate the use of the .338 Lapua Magnum chambering. The sight is mounted directly to the barrel as normal, however, the design allows the barrel and sight to be removed from the body of the rifle by undoing the two hex bolts, accessed from under the body. This allows the rifle to be carried in a more compact fashion and can be reassembled easily in less than 30 seconds. The safety catch is mounted on the rear of the bolt and reveals a large red dot when pushed forward and up to the "fire" position. One feature of the bolt is that when unloaded and no magazine inserted, the safety has to be pushed forward slightly in order to pull the bolt back. The 5 round magazines in .308 calibre sit flush with the underside of the body when inserted. R93 Tactical (1st gen) (1993-1997): Detachable box magazine, Double Stack, Double Feed (10 round). Chassis and barrel compatible with the regular R93. Diopter sight UIT and CISM versions available. R93 Tactical LRS2 (1997-2005): Detachable box magazine, Single Stack (5 round). The 2nd gen is a ruggeriezed version, also known as Long Range Supporter 2 (LRS-2). New magazine design. Some of the different calibers may require different magazines. R93 Tactical LRS2 .338LM: Large chassis version to facilitate .338 Lapua Magnum. Blaser R93 Tactical 2 (2005-): Large chassis version, available in .223 Rem, .308 Win, .300 WinMag, .338LM. Argentina: Used by the Law enforcement in Argentina. Australia: Used by the Australian Defence Force and various Police Tactical Groups. Bulgaria: Used by the Bulgarian Armed Forces Special Forces. France: Used by special unit of Prefecture de Police de Paris named "Brigade d'Intervention"
Germany: Used by German Police. Iceland: Used by Icelandic Police. Netherlands: Used by Dutch Police. Poland: Used by Polish Border Guard. Slovenia: Used by Slovenian Police Special Forces. Ukraine: Used by special unit of Security Service of Ukraine named "A Group". Brazil: Used by Comando de Operações Táticas (COT) Counter-Terrorism Forces of the Federal Police. Wikimedia Commons has media related to Blaser R93 Tactical.